And why you can’t afford not to. Old hard drives, fax machines, and other equipment contain hundreds of thousands of confidential data files. And, although you may have deleted many or seemingly all of them, it’s impossible to fully obliterate the data. Identity thieves or hackers have tools and software to extract any information that’s left behind. And even just the smallest bit of information is enough for them to commit ID theft against your company or your clients. No matter what business you’re in, you are responsible for keeping your confidential data safe from breaches and hackers. Those in the healthcare and financial industries should be well aware of the requirements from HIPAA, GLB and FACTA. If you fail to properly protect your clients, vendors and staff from unauthorized access, you could face hefty fines from various local and federal organizations as well as industry watchdogs. When you consider the amount of space you’re using to store old devices, you should also take into account the cost of that space for your business. You’re paying for every square inch of your office building—and could be using that storage room for income generation, instead of housing outdated or inoperable devices. Most of the companies that have suffered breaches also suffer from losing the trust of their clients. If you’re like most organizations, you’ve built your reputation and your business by demonstrating your commitment to your customers, the community and your standing in the industry. It’s difficult to rebuild after losing thousands of records or having your company bank accounts and credit cards hacked. When you think about it, the permanent destruction of your old devices can only benefit your company. Just as you shred documents on a regular basis to prevent sensitive information from falling into the wrong hands, shredding old hard drives and other devices can also keep your company data safe. Deleting files or attempting to wipe the hard drive clean does not insure against hackers. All Points Mobile Shredding offers full-service shredding and destruction onsite at your organization. 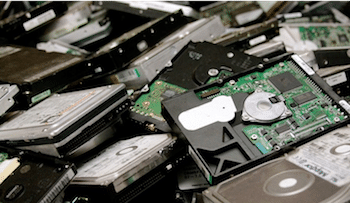 We are NAID AAA certified and our state-of-the-art trucks can shred up to ten hard drives per minute, making it quick and easy to handle any destruction project. Give us a call to find out how we can serve you or fill out a quote request.